SlimLine 30-inch x 60-inch Single Threshold Shower Base in White Right Hand Drain Base with Back Walls is rated 4.1 out of 5 by 8. Rated 5 out of 5 by Diane from Looks really nice. Can’t speak about the installation process... Looks really nice. Can’t speak about the installation process because I hired someone to do it. Rated 4 out of 5 by Smitty from First time I've installed this item. The plastic/acrylic panels... First time I've installed this item. The plastic/acrylic panels are really flexible, they sure have to be securely glued to a solid backing. To be frank, when installed, they look like something one would expect in a mobile home. End result, looks ok, but I wouldn't want it I'm my home. 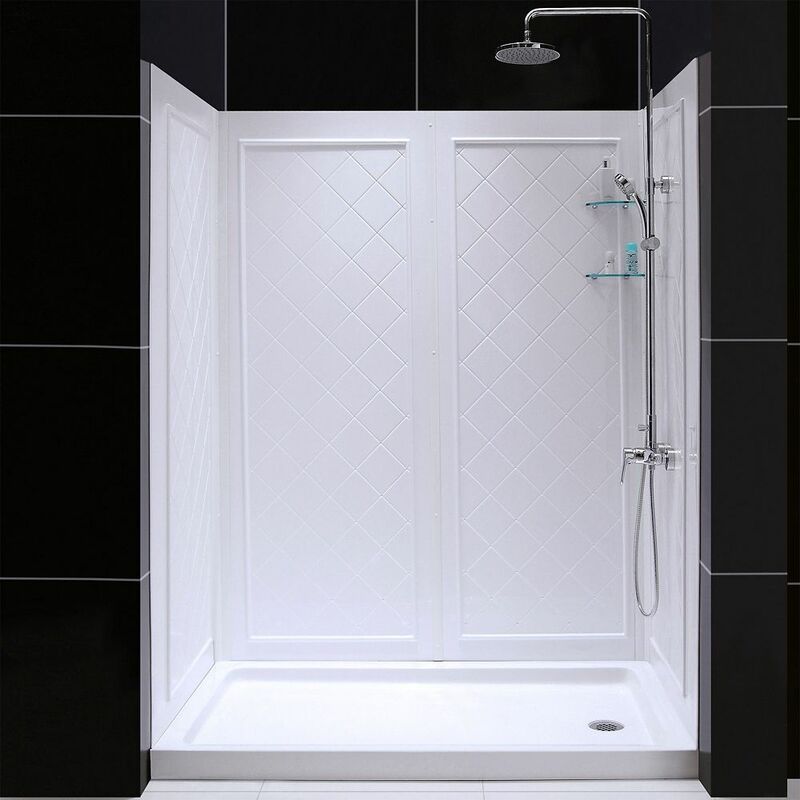 Rated 3 out of 5 by MJ from SLIMLINE SHOWER BASE & WALL SURROUNDS The shower base is good quality & both plumbers I contacted were impressed with the underneath supports. Shower base did NOT come with a drain which was not mentioned either by the manufacturer or the seller - would have been nice not to have had to make an extra trip to get one. Shower surround walls are very thin & came damaged. Store associates were very accommodating and ordered replacement walls with an ETA of 12-days. Installation manual advises to use caulk and sealant, but does not advise what type or what brand will maintain the warranty. I spoke with manufacturer tech support who clarified which types and which brands to use for installation.